As it is a known factor that lens selection and proper usage of lenses with cameras and lighting play a major role in Machine Vision applications in any automation platform. Liquid lenses are a new technology rapidly gaining popularity in the industrial sector. They offer numerous benefits over traditional lenses in a wide variety of applications. In fact, it’s their versatility and flexibility that have been the main drivers of their successful adoption. Liquid lenses overcome these limitations by quickly adjusting focus to accommodate for objects located at various working distances or objects of different heights. Liquid lenses are small cells containing optical-grade liquid that change their shape when a current or voltage is applied. This occurs within a matter of milliseconds and causes the lens’ optical power, and therefore focal length and working distance, to shift. Integrating liquid lenses into imaging systems is an ideal solution for applications requiring rapid focusing, high throughput, and accommodation for depth of field and working distance. Autofocus capability is core to the ability to take a superior photo, and liquid lenses bring brand new capabilities in autofocus. Essentially, liquid lenses are used in any application where there are large variations in object distance which require fast autofocusing. Liquid lenses use an electrowetting process to achieve superior autofocus capabilities. The lens itself is a sealed cell with water and oil inside. The electrowetting process shapes the oil drop into an effective lens quickly and accurately. The process is continuous, reversible and fast for small and large focus steps alike. Note that liquid lens technology involves no moving mechanical parts. This makes them highly resistant to shock and vibration. It also enables a stable optical axis in any orientation, making liquid lenses a durable alternative to mechanical options. The main benefits provided by liquid lenses are their flexibility to be used in several different applications simultaneously. This is especially useful in high volume production environments where different sized objects are being used. For example, a pharmaceutical company may use machine vision inspection for different types of capsules, pills, gel tablets, etc. With traditional lenses, there would need to be several image systems set up to inspect each product, or one image system would have to constantly have the depth of focus changed. With liquid lenses, one image system can do the work of multiple image systems. Different object distances can be programmed into the image system, eliminating the need to stop production to change depth of focus or to set up several different image systems. Liquid lens technology, due in large part to the flexibility it provides, has exploded in popularity in the industrial sector. Liquid lenses are well-suited for a wide range of applications and can even provide a higher image quality than many mechanical options. 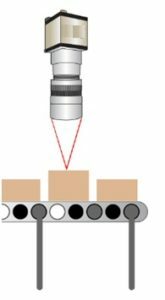 Increase throughput in high-speed machine vision systems Ideal for barcode reading, rapid automation, package sorting, and security. The figure below show the “Liquid lens adjusting working distance to image objects of different heights as they pass by on a fast-moving conveyor belt”. While a conventional imaging lens requires mechanical refocusing for every object height, a liquid lens refocuses without requiring mechanical translation. Liquid lenses can function by several slightly different processes: electrowetting, current-driven polymers, or sound piezoelectrics. Electrically-focused liquid lenses consist of a container filled with optical fluid and a surrounding polymer membrane. A current-driven actuator applies pressure to the edges of the membrane, causing the curvature of the lens (and therefore its optical power) to change. Electrically-focused tunable lenses focus within milliseconds and function with low operating voltages. They do not alter polarization, typically have high laser damage thresholds, and introduce minimal aberrations. Liquid lenses quickly adjust focus to accommodate objects located at various working distances. Liquid lenses are small, mechanically or electrically controlled cells containing optical-grade liquid. When a current or voltage is applied to a liquid lens cell, the shape of the cell changes. This change occurs within milliseconds and causes the optical power, and therefore focal length and working distance, to shift. Many manufacturers have designed liquid lenses that operate via slightly different processes: electrowetting, current-driven polymer, or sound piezoelectric. Liquid lenses are an ideal solution for imaging applications requiring rapid focusing, high throughput, and depth of field and working distance accommodation. Liquid lenses have very fast response times, are electrically tunable via voltage or current, and respond in a matter of milliseconds. Fixed Focal Length and Zoom lenses often rely on mechanical or manual adjustments to change focus, which can slow the imaging system. Liquid lenses can be implemented in various locations throughout an imaging system, along with being embedded within or threaded to the front or rear of an imaging lens. Mechanics are eliminated in a liquid lens which enables their compact design. In addition, liquid lenses are comparable in functionality to many individual lenses within an assembly. By removing those lenses and replacing them with a small liquid cell, the overall size and weight of the full lens is reduced. Liquid lenses are limited by their small aperture sizes – the largest is approximately 16mm in diameter. The small apertures restrict liquid lenses and only allow for use with sensors up to about 1/1.8” if the lens is retrofitted onto the front of an existing machine vision lens. Liquid lenses embedded inside systems do not reduce sensor coverage. Liquid lenses are designed to operate across a very wide range of optical powers (focal lengths) at high speeds. By eliminating the moving parts and mechanical adjustments typically found in fixed focal length and zoom lenses, the focusing process is quicker. Depending on available equipment and the application, liquid lenses can be difficult to integrate. Liquid lenses can be used in conjunction with many accessories, such as filters and apertures, which are required by many high-speed applications, such as distance sensors or controllers. Liquid lenses consume very little power. Typical mechanical lenses are capable of ~100,000 cycles, whereas a liquid lens can withstand approximately ~50,000,000 cycles (Berge, 2013). The adaptability, speed, and versatility of liquid lenses make them ideal for a variety of machine vision, life science, and measuring and inspection applications. 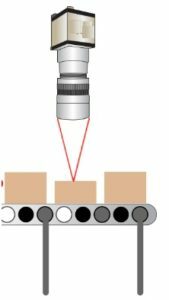 Due to their traditional mechanical layout, standard machine vision lenses struggle to capture sharp and accurate images in high-speed or precise applications that require quick refocusing. High-volume assembly lines require fast, accurate, and precise throughput. Integrating a liquid lens into an inspection systemis an optimal, compact, and economical solution when focusing at multiple distances is required. Liquid lenses are an ideal solution for barcode inspection, package sorting, quality control, and rapid automation (see Figure 2). Note: The above article is a collection from various web sites, manufacturers and distributors/integrators of Liquid lenses. If any company/individual finds any ownership of contents – they can let us know at info@onlsol.com to either change or remove the contents. Article is provided only for the information purposes and facts can be cross verified by the readers.